While looking for new yummy quinoa recipes I came across the blog Authentic Suburban Gourmet and saw this yummy one. It looked delicious and incorporated lots of things I love, plus some new elements I was excited to try (raw zucchini, mint). I made it at the beginning of the week and ate it all week long for lunches. I just kept the arugula separate and mixed it in when I was ready to eat. It was amazingly fresh and light, yet so filling as well. Definitely a perfect combination of flavors for summer! In a medium sauce pan, add the quinoa and chicken stock plus ½ t. of salt. Quickly stir and bring the mixture to a boil. After it boils, reduce the heat to simmer and cover with a lid for about 10 minutes. Check and stir the quinoa. If liquid remains, check every 2 to 3 minutes until liquid has evaporated. Set aside to cool. 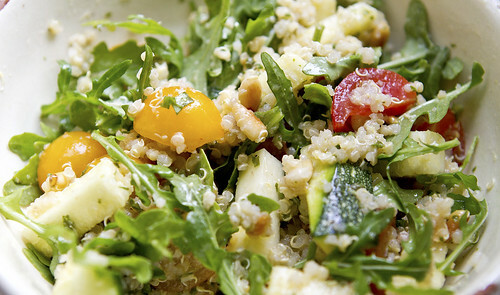 Once the quinoa is cooled, add to a large bowl to assemble the salad. Add the zucchini, tomatoes, pine nuts and cilantro. Toss gently and add the vinaigrette and toss again to combine. Right before serving, toss in the Arugula. Taste and then season with additional salt and pepper as desired. Add all of the above ingredients to a food processor. Pulse until well combined. Taste and adjust salt and pepper to your desired taste level. Set aside to strengthen the flavors for about one hour.